Here are the events I’m aware of for August 2017, primarily occurring in the slightly modified South (basically on/below a line from Kansas to Maryland as indicated below) since that’s where our club membership is based and most of our current readers are located. I have gone through each of these listings and when possible posted only the actual page the info is on, bypassing any “intro” pages that take up your time and/or only advertise a dealer or sponsor. Please follow links provided with each entry to determine admission fee (if any), pre-registration procedures, possible minimum age requirements, and any other pertinent information. If you know of any other events please send me the details, including a valid website or online-flyer link, so I can add them. Events without their own website, or a substantial information page or flyer, will not be added. I also do not list “events” that are basically only advertising items for sale at motorcycle dealers or parts stores with only a reference to some brief, purchase required, customer-grabbing event. I’m not against these retailers, some are close friends, however this type of “event” is considered to only be for the benefit of the retailer. If you’re looking for an event to attend, but not finding quite what you’re looking for, check back here periodically. I add new events as soon as possible after I’m informed about them. We have added a proprietary map of the events listed below. Click HERE to view full size interactive map. Here are the events I’m aware of for July 2017, primarily occurring in the slightly modified South (basically on/below a line from Kansas to Maryland as indicated below) since that’s where our club membership is based and most of our current readers are located. I have gone through each of these listings and when possible posted only the actual page the info is on, bypassing any “intro” pages that take up your time and/or only advertise a dealer or sponsor. Please follow links provided with each entry to determine admission fee (if any), pre-registration procedures, possible minimum age requirements, and any other pertinent information. Here are the events I’m aware of for June 2017, primarily occurring in the slightly modified South (basically on/below a line from Kansas to Maryland as indicated below) since that’s where our club membership is based and most of our current readers are located. I have gone through each of these listings and when possible posted only the actual page the info is on, bypassing any “intro” pages that take up your time and/or only advertise a dealer or sponsor. Please follow links provided with each entry to determine admission fee (if any), pre-registration procedures, possible minimum age requirements, and any other pertinent information. Here are the events I’m aware of for May 2017, primarily occurring in the slightly modified South (basically on/below a line from Kansas to Maryland as indicated below) since that’s where our club membership is based and most of our current readers are located. I have gone through each of these listings and when possible posted only the actual page the info is on, bypassing any “intro” pages that take up your time and/or only advertise a dealer or sponsor. Please follow links provided with each entry to determine admission fee (if any), pre-registration procedures, possible minimum age requirements, and any other pertinent information. This event is intended to give bikers, motorcycle enthusiasts, and the general Dixie Riders™ MC membership a few hours of shooting pool, eating snacks, and social fun. There will be hot food, drinks, and music. Fast Eddie’s is both a Pool Hall and Sports Club which has both 8′ and 9′ Pool tables. There are also Ping Pong tables, Darts, Juke Boxes, Golf Games, and more! They offer domestic beer, local beer, and craft cocktails. Their food offerings range from Popcorn or Pizza to Nachos, Jalapeno Poppers, BBQ, and other tasty selections. Non-Dixie Riders™ Motorcycle Club members not only **welcome** but **encouraged** to attend. 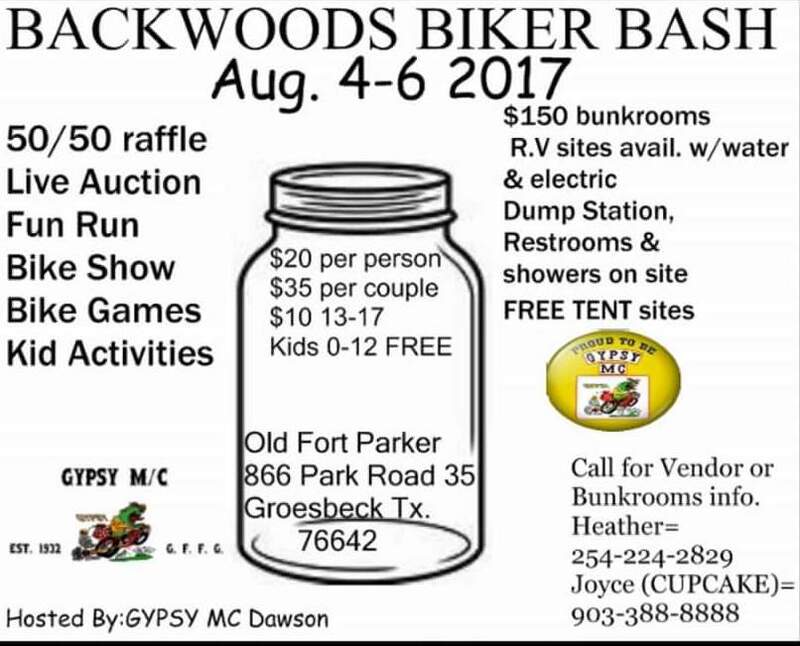 Attendance will be by other bikers, club members, and the general public. Please base your behavior and clothing choice(s) with regard for any non-club people who may be attending. As always, we hope you are able to come out and join us for this event. Bikers, Hot Food, Cold Beer, and Live Music By A Fantastic Guitarist, Blake Sticker (https://www.youtube.com/watch?v=sagXqBI0-DY) What else could you ask for? This is an OPEN event. Dixie Riders™ MC members and non-members are all equally welcome to attend. Here are the events I’m aware of for April 2017, primarily occurring in the slightly modified South (basically on/below a line from Kansas to Maryland as indicated below) since that’s where our club membership is based and most of our current readers are located. I have gone through each of these listings and when possible posted only the actual page the info is on, bypassing any “intro” pages that take up your time and/or only advertise a dealer or sponsor. Please follow links provided with each entry to determine admission fee (if any), pre-registration information, and any other pertinent information.